Nominated for an Academy Award and highly recommended by a friend, I had high hopes for My Architect. But this aimless documentary never sucked me in, and its amateur qualities disappointed. Students of architecture will probably find more to like than students of filmmaking. Nathaniel Kahn grew up waiting for his father, Louis I. Kahn. He and his mother expected Louis to leave his wife and daughter to come live with them, but he never did. Even after Louis’ death, Nathaniel’s mother was convinced his return was imminent. But instead of daydreaming and waiting, Nathaniel went out in search of his father’s soul, making this documentary in the process. 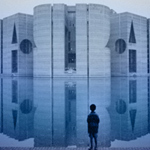 What makes Nathaniel’s movie worthy of distribution is that his father, Louis I. Kahn is a famous architect. While searching for his dad, Nathaniel interviews some of the greats of modern architecture. They tell stories of Louis, both personal and professional, forming a portrait of the artist. There is a wealth of archival footage of Louis, at work and on job sites, and these moving images help illustrate the man described by his peers. Never having had a class in the architectural arts, some of the structures, styles, and names may have gone over my head. I recognized I.M. Pei, but these names may mean more to you than they did to me: Frank O. Gehry, B.V. Doshi, Philip Johnson, Moshe Safdie, Robert A.M. Stern, and Edmund Bacon, to name a few. Clearly, Nathaniel has connections, and for many people that will be enough to make My Architect worth a look. But as a storyteller Nathaniel falls short, so to the architecturally disinclined, watching My Architect is harder to justify. Nathaniel doesn’t seem to know how to make a documentary about his dad. He speaks with Louis’ colleagues, acquaintances, and lovers, but Nathaniel lacks focus. What exactly does he want to know, besides “everything”? He doesn’t direct the interviews, and so his subjects lead the conversation in different tangents. One time he decides capriciously not to reveal that he is the son of Louis, springing it on the subject after speaking with him for hours. The worst scene of the movie, and representative of what Nathaniel does wrong, is one in which he speaks to a man who claims to have been present when his father’s body was found in Penn station. First the man is late, and Nathaniel shoots footage of himself waiting. When the witness finally shows up, he really can’t remember anything. He tries to sketch a diagram, which Nathaniel dutifully photographs, but the diagram doesn’t explain anything, and neither, ultimately, does the witness. The interview subject was a dead end, yet Nathaniel includes it in his film. Sometimes, getting to know his father takes the shape of a visit to a respected place, like the Salk building in La Jolla, California, or the sterile apartment building that even Nathaniel finds hard to love. In these episodes, Nathaniel spends some time gawking at the place with his video camera and his 16mm Bolex. He often uses time-lapse photography to try to convey a sense of continuity along with the sense of place. But My Architect suffers a bit from the “dancing about architecture” syndrome — using one medium to try to capture another. After a while, the time-lapse photography becomes tedious. When he adds a hugely symphonic Ode to Joy over yet another of these time-lapse moments, the disconnect between music’s grandiose sweep and the film-school photographic effect brings unintended laughs. My Architect does do one thing well, and that’s explain Louis’ architectural style. Returning from a trip to Greece and Rome, Louis was reinvigorated. The ancient ruins inspired him, and helped to solidify his own style. In a word, Louis’ style is “monumental.” His later works are massive. They look heavy and imposing. They are made of brick and concrete, which are allowed to show through, scars and all. Nothing covers the materials composing the structure. And yet against this masculine ideal there is feminine beauty in arcs and diagonals that break from the rectilinear. Two of the most revealing scenes happen half an hour apart, but they go together nicely. Pei says Kahn was an artist, not a contracting architect, and that he was the only architect who was able to work in that way. The scene that completes Pei’s comment is of Edmund Bacon, one of the past city leaders of Philadelphia who reviewed architectural plans for a new downtown. To this day he still passionately hates the idealism of Kahn’s designs. For example, Kahn had proposed massive parking structures at the edge of downtown, leaving downtown only open to pedestrian traffic, an offensively radical and impractical pipe dream in Bacon’s mind. These insights came after digesting the movie. Watching it is not so interesting or enlightening, and it includes a lot of footage that feels like filler. The movie seems self-indulgent, Nathaniel begging our patience while he investigates what’s of interest to him, and including the results no matter how relevant they are. I have friends and family who are architects and I imagine them getting more — much more — from this movie than I did. But as a student of film and not of architecture, I found little to like in My Architect.